*Product was received. Opinions are my own. I am totally redoing our home. I want fresh and new everything. This, of course, is taking some time (and money!). But so far, I have purchased a few items for the walls and next will be the paint. One item for the wall, that I did receive, is a really nice canvas print. I love the saying on it and the colors. 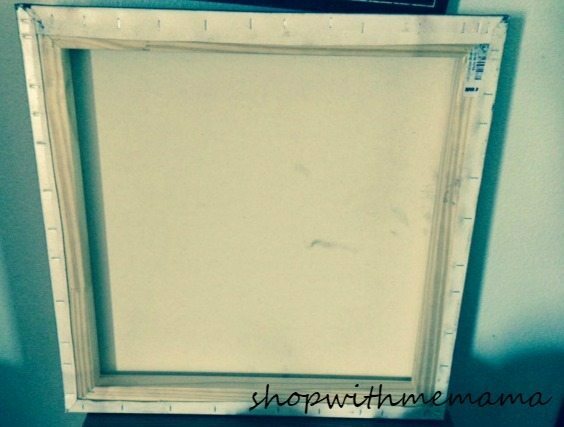 I am trying to keep everything neutral, and this canvas is perfect. 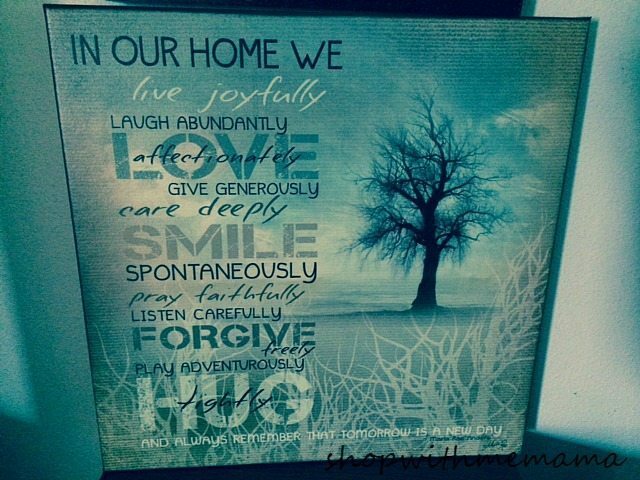 The canvas is called, ‘In Our Home’ and it is a fine print on a 1 1/2″ deep canvas, by Marla Rae. It arrived in perfect condition and it is ready for hanging, I just have to paint my walls first! I love the size of it (18×18) and the saying is beautiful and perfect to hang in my living room. Fulcrum Gallery has tons of art to choose from. I also really like the word art. I am going to have to go back and browse that section and choose a couple of canvases for my kid’s bedrooms. I just love Fulcrum Gallery’s Wall Art and Home Decor! You can purchase the canvas wall art I received (or other art) online at http://www.fulcrumgallery.com/. The canvas I received, retails for $82.79. I would choose the unicorn artwork Item#: 185105. I might choose the John Rossini	The Joy of Snow with a black frame, all of them are so beautiful its hard to pick. I would choose the Horse and Buggy Days and the House with Flag. I really love both the Vincent Van Gogh Blossoming Almond Tree, Saint-Remy, c.1890 and the Claude Monet Garten von Montgeron! I love the Jon Bertelli	Curiosity print. It is awesome. I would choose Eric Enstrom’s Grace as I grew up with that same picture hanging on the wall of my parent’s house. I would choose Stephen Fishwick	Kemp’s Ridley with the black frame. I would choose the James Wiens – Golden Birch I with Blue Sky. There are so many pieces I love that it is hard to pick just one! I think I would get the Bridge Over Troubled Waters. My office could use some love! I’m not totally sure, maybe the “Happily Ever After” but “My love for you will never end” is nice, too. I’m not sure, I would have to really go through things meticulously!! I think I would pick the Loran Speck Italian Feast for our kitchen. So so many choices! I would probably choose a photography photo or an impressionist one. I would choose the Dogwood Blossoms in Negative, they are amazing! To make a be compassionate,, to make a difference in someone’s life, on the Gallery wrap canvas. Love decorating my 2 daughters rooms with inspiring and positive quotes, they love them too, always looking for new ones. To make a be compassionate,, to make a difference in someone’s life, on the Gallery wrap canvas. I love the Danny O Vintage Collage II! i would get something with a flamingo. they had so many good ones its hard to choose. would love to have the Jennifer Nilsson Baby Girl Animal Quilt for my soon-to-be nieces room! ty for the chance to win! I love the Birds on a Beach black and white photo. I would choose winter tree line 1. I am partial to black and white pictures especially when they are of trees. I would choose Leila Momentary. I’d get a print on canvas. I would love to get a photo canvas. Thanks for the chance to win! I think I would choose the Village on the Bank of a Stream by Johan Frederick Thaulow. I think I’d get the Ballerina Princess and Be for dd’s room! I would love to get the Live Simply wall art! Awe! Bless your heart sweetie!! Good luck to you! I like several in the quote prints, the scenic art, and the seasonal art. I would totally choose the Home is where our story begins! I would choose some of the Vintage Pin up Girls, and the Bottoms up in the Retro section!